10. At the tenth spot on this list is the Chevrolet Camaro SS. This Camaro beats Ford in the race for the best V8 horsepower car. The cost of this Chevrolet is 38,000 dollars, which is a little more expensive than the Ford Mustang, but for the extra couple thousand dollars you get an amazing engine. This engine is a 6.2 liter V8 that pumps out 455 horsepower and 455 pound feet of torque, and zero to sixty happens in just four seconds flat. Also, the Camaro SS can do the standing quarter mile in just 12.3 seconds. 9. At the ninth spot on this list is the Dodge Charger SRT 392. This four-dour sedan does not quite have the 0-60 and 0-100 numbers of the 2017 Chevrolet Camaro SS but it has more horsepower and that is why it is at a better spot than the Chevy. This Dodge is not as fast as the Chevy because it weighs more but this car has more horsepower. The engine on this Dodge Charger SRT 392 is a 6.2 liter Hemi V8 engine. This pumps out 485 horsepower and 475 pound feet of torque. 8. At the eight spot on this list is the Dodge Challenger SRT 392. Sounds similar to the car at the ninth spot? The difference is this one is a Challenger and the car at the ninth spot was a Charger. For under 50,000 dollars you can get 485 horsepower and 475 pound feet of torque (which is the same as the Charger, but the Charger goes from 0-100 in 12.4 seconds and this Challenger goes from 0-100 miles per hour in 12 seconds flat and that is why it gets the eighth spot on this list). 7. At the seventh spot on this list is the Chevrolet Camaro Z28. The Z28 nameplate is legendary among Camaro fans, and when it returned in 2014, it brought it right back to the track. 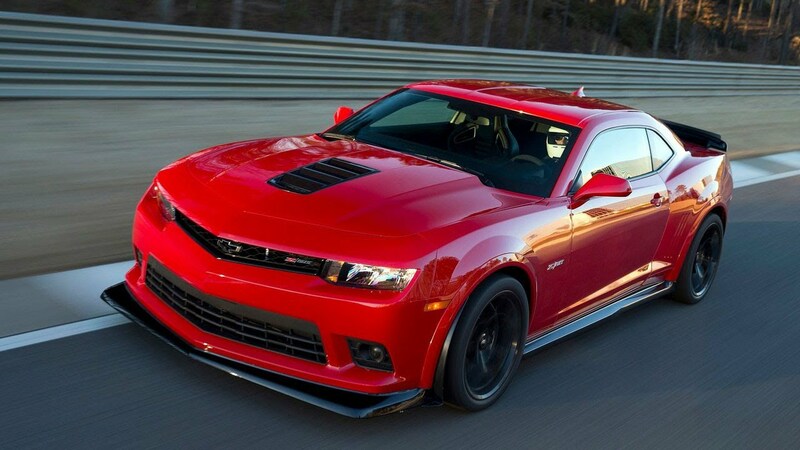 The latest Z28 proved that muscle cars have figured out how to take a corner , fast. Zero to 60 in this “track rat” comes in four seconds flat, and quarter-mile runs come in at about 12.2 seconds, besting all but a few muscle cars on the market. But lightness and suspension adjustments are what made the Z28 so formidable. The engine on this car is a 6.2 liter V8 engine that pumps out 505 horsepower and 481 pound feet of torque. 6. At the sixth spot on this list is the Shelby GT350R. Such a long name (GT350R) for a simple American muscle car. In a throwback to the 1960s, Shelby has transformed the Mustang into one of the most formidable track cars in the world. For under $60,000, you get Ford’s outrageously high-revving V8, which pumps out 526 horsepower and 429 pound-feet of torque. For $10,000 more, you get a lighter and even more focused track car, the R. In that car, zero to 60 comes in at 3.9 seconds, and you can make the quarter mile sprint in 12.5 seconds. 5. At the fifth spot on this list is the Equus Bass 770. I’ve never heard of this car until now, have you? Can a hand-built, $250,000 performance car truly be a raw piece of American muscle? Yes it can. Seemingly a cross between a classic Mustang, Camaro, and Charger, the Equus Bass 770 (pronounced like bass guitar, not the fish) brings serious speed and power to the table , for a very wealthy few. Boasting a supercharged 6.2-liter V8 engine borrowed from the C6 Corvette ZR1, the Bass 770 makes 640 horsepower and 605 pound-feet of torque, while reaching a speed of 60 miles per hour in just 3.4 seconds. But with plans to build just 250 of these , chances are you probably won’t be seeing a Bass at your local drag strip anytime soon. 4. At the fourth spot on this list is the Chevrolet Camaro ZL1. So far, the Z28 is taking a breather from the Chevrolet Camaro lineup. That leaves the new ZL1 as the baddest and fastest of the bunch. The ZL1 is a 650 horsepower monster equipped with a 6.2-liter supercharged LT4 V8 engine that knocks out 650 pound-feet of torque. Top speed is 195 miles per hour, and it can jet to 60 miles per hour in just 3.5 seconds, running the quarter mile in under 12 seconds. Which might not sound that fast from just reading but when you get in cars like these that go as fast as that it goes by in a blink of an eye. 3. At the third spot on this list is the Shelby Gt500. The current GT350 is a lithe, brutally fast track car; t. Doing the quarter mile in 11.5 seconds, the Shelby tops out at 189 miles per hour behind the power of 662 horsepower and a monstrous 631 pound-feet of torque, courtesy of a 5.8-liter supercharged V8 engine. It can also rocket to 60 miles per hour from a standstill in just 3.5 seconds. 2. At the second spot on this list is the Dodge Challenger SRT Hellcat . This car, perhaps the most aptly named vehicle ever , has made a name for itself as the most powerful production muscle car of all time, and so far, nearly 20,000 people have put down their hard-earned cash for one. The Hellcat makes a hearty 707 horsepower and 650 pound-feet of torque, which allows it to spring to 60 miles per hour in around 3.5 seconds on its way to an overall top speed of 199 miles per hour, putting it in a class with super-cars from Ferrari and Lamborghini (which cost hundreds of thousands of more dollars than this car). 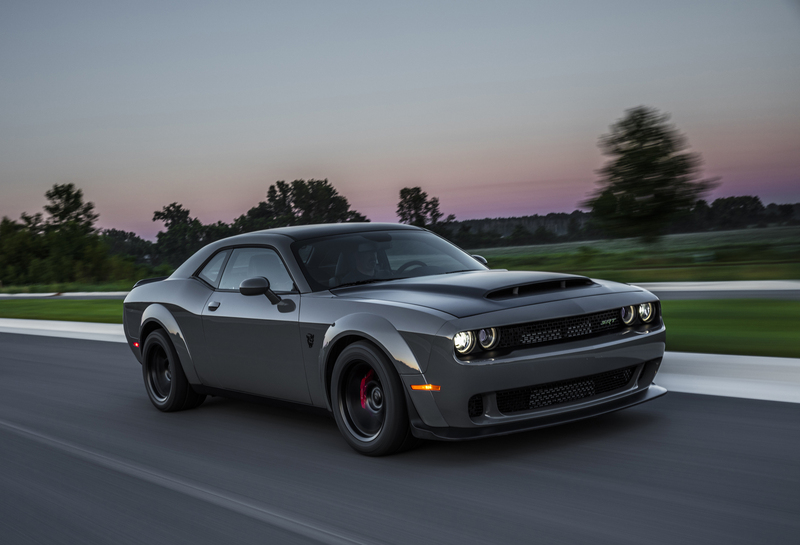 The quarter-mile can also be done in a relative snap, as the Hellcat can get it done in 11.2 seconds. At the first spot on this list is the Dodge Challenger SRT Demon. Just from the name of this car you can tell that it will be fast. This Dodge has a 6.2 liter Hemi V8 engine. The amount of horsepower that this pumps out is an amazing 808. Also, this car has 717 pound feet of torque. Just to put this into prespective for you the stock Lamborghini Huracan has 630 horsepower and this Dodge Challenger SRT Demon has almost 200 more horsepower than that. This Dodge Challenger SRT Demon has a base price of just 83,295 dollars, which is cheap for the amount of stuff that you get with this amazing car. This car does 0-60 in just 2.1 seconds (which is one of the quickest in the world.